328 pages | 4 B/W Illus. Death has never been more visible to consumers. From life insurance to burial plots to estate planning, we are constantly reminded of consumer choices to be made with our mortality in mind. Religious beliefs in the afterlife (or their absence) impact everyday consumption activities. 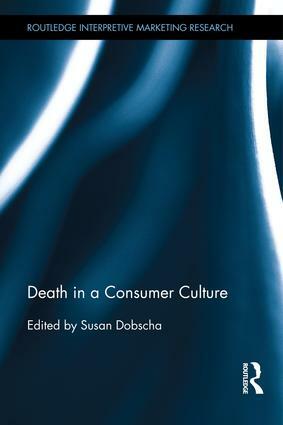 Death in a Consumer Culture presents the broadest array of research on the topic of death and consumer behaviour across disciplinary boundaries. Organised into five sections covering: The Death Industry; Death Rituals; Death and Consumption; Death and the Body; and Alternate Endings, the book explores topics from celebrity death tourism, pet and online memorialization; family history research, to alternatives to traditional corpse disposal methods and patient-assisted suicide. Work from scholars in history, religious studies, sociology, psychology, anthropology, and cultural studies sits alongside research in marketing and consumer culture. From eastern and western perspectives, spanning social groups and demographic categories, all explore the ubiquity of death as a physical, emotional, cultural, social, and cosmological inevitability. Offering a richly unique anthology on this challenging topic, this book will be of interest to researchers working at the intersections of consumer culture, marketing and mortality. Susan Dobscha is Professor of Marketing at Bentley University in Waltham, USA. She explores gender issues in marketing, particularly in the context of the Filene's Basement Bridal Event; consumer resistance to marketing tactics; and the role of consumption in a woman's transition into first-time motherhood. She has also studied sustainability issues related to consumer culture. She has written articles for Harvard Business Review, Journal of Public Policy and Marketing, Journal of Macromarketing, Consumption, Markets, and Culture, Marketing Education Review, Advances in Consumer Research, Developments in Marketing Science, and Advertising and Society Review, and has presented her work at numerous conferences. She recently co-chaired the 9th ACR Conference on Gender, Marketing, and Consumer Behavior.